CZ Cellulose Fiber is made with 100% recycled paper, treated with chemicals to prevent it from burning and to repel rodents and insects. Does the insulation process create dust? As a result of the installation process, some dust will be generated if there are gaps between the corners and the wall. When blowing around the manhole some dust will be generated. Can Cellulose Fiber effect my health? Not at all, CZ Cellulose Fiber does not have any negative health effects. Does Cellulose Fiber have a Guarantee? CZ Cellulose Fiber is guaranteed to outlast the house it’s been installed in. What is the recommended thickness of the insulation? We recommend that CZ Cellulose Fiber be installed at 100mm thickness. This could change depending on the design of the roof structure. Flat roofs might require a thicker installation. Your budget could also have an influence on the thickness. What happens when my insulation gets wet? CZ Cellulose Fiber does not support rot. When it gets wet, it simply dries out and all is back to normal. 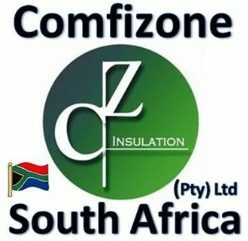 It is however always important that you make sure that your water proofing is in order before install CZ insulation.